With plenty of moving services, Meathead Movers is fully prepared to make Paso Robles your new home. Our clean-cut student athlete movers are dedicated to fulfilling all your moving needs efficiently. Welcome to Meathead Movers of Paso Robles! El Paso de Robles, or as locals call it, “Paso,” is a wonderful place to call home. 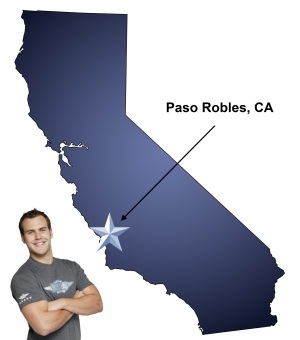 If you’re looking for Paso Robles Movers, look no further. Meathead Movers was founded in 1997 just down the road from Paso, in the city of San Luis Obispo, and has been serving the North County ever since. Paso Robles has been touted as California’s second Napa Valley and is proud to be the fastest growing wine region in the state. Paso has the perfect conditions for such wine grape varietals as Cabernet Sauvignon, Merlot, Syrah, Zinfandel and more. Quality of life continues to get better as the wine travel industry booms, bringing new exquisite restaurants, boutique hotels, and wonderful vineyard-surrounded bed and breakfasts. If you’re moving to Paso Robles you’ll get a lot of bang for your buck, as Paso has amongst the most affordable housing in all San Luis Obispo County. The city of Paso Robles has proven its dedication to smart sustainable growth, evident through the revitalization of the Town Centre, being bike friendly, and its river walk. Paso Robles also hosts amazing annual events such as the Paso Robles Zinfandel Festival (aka “Zin Fest”) and the Mid-State Fair, which always has famous headliner performances and draws huge crowds from around the state. So stop vacationing there and start looking for Paso Robles Movers! We offer both local and long-distance moving services that can move you to Paso Robles from anywhere in the state of California. Our honest, all-American student-athletes are the best movers in the industry and our legendary hustle and customer service will leave you happy you chose us. On top of our first-class moving services, we also offer packing services, storage services, and a complimentary concierge service. As the only Paso Robles Movers to offer a 100% satisfaction guarantee, the only thing you have to lose is the stress that comes from moving! If you want a team of dedicated movers you can count on, contact us today for a free no-obligation moving quote. Moving to Paso Robles? Here are some helpful resources. “Our Prince & Princess movers were great. Efficient, Affable people. We enjoyed their personalities and benefitted from their work ethic. From our first contact with your company to the completed job, everyone was professional, courteous and efficient. View more Paso Robles resources. Our Prince & Princess movers were great. Efficient, Affable people. We enjoyed their personalities and benefitted from their work ethic. From our first contact with your company to the completed job, everyone was professional, courteous and efficient. Thank you to Molly and our packers, Stephanie and Trevor. We were very happy with the athletes that moved my parents household. They were knowledgeable, helpful, kind, polite, and respectful. What more could I ask for. They were a 10 in my book!! Thank you!! Great service, everyone at Meathead is nice! I like that the guys show up, work together as a team, and are constantly moving. I also like that they listen when I talked to them! Go over prices for supplies beforehand and have enough supplies. Also help getting more of the job done and not just leaving with so much of the job left to do. The evaluation should be faxed back in and not filled out with someone from Meathead movers standing over your shoulder.